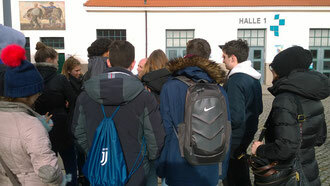 In Januray visited a second time the State International School Seeheim-Jugenheim Dresden. This School offer since 2017 a journey to Dresden. I got the chance, to instruct the students about Kurt Vonnegut Jr. as POW in Dresden, and the situation of the air raid on the 13./14.02.1945. I´m realy lucky, if clients use this offer as a alternative City walk trough Dresden. All the students readed his famous Novell "Slaughterhiuse 5 or the Childrens Crusade". I can see, how the students see the reality with other eyes, after this unique tour. The year 2019 is the 50 anniversary of this Novel, where was published 1969. The Nightwalk Dresden offer a secial Programm on this time. Visit the homepage of Kurt Vonnegut Jr in Dresden. If you are interested about this offers, please send me you request. At the moment is all in progress.